Givi PL-528. I got mine from Twisted Throttle. (they have military discount) The rack was very easy to install. They (the bags) are quick release - very easy to snap onto the mount, but it took several minutes to get them off the first time. Maybe with practice. You have to push down on the plastic ring/loop surrounding the key - not pushing the actual key and key assembly. I run the 21s. Great bags. It's deceiving how much they will hold because you can fill them to the top. They use their interior space more efficiently than side loading bags. I've done month long trips with a set of E21s and a 34 liter top case. 1978 Suzuki GS1000 "Tennessee Hillbilly"
You can mount the e22's in either direction on any bike. 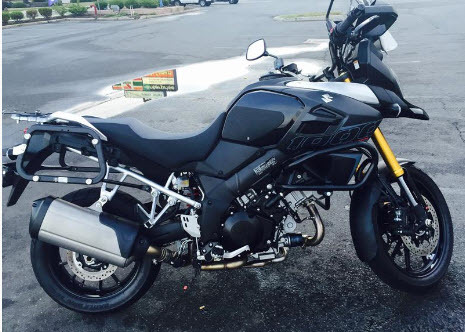 I have the Givi racks, and mount mine "backwards"
You can mount them either way. Mine face the other way now. The lower side forward makes it easier to throw a leg over, but my top box makes the hinge on the other side more desirable. Last edited by Bville-Bud; 05-23-2016 at 09:23 AM. Last edited by Pushrod; 05-23-2016 at 02:12 PM. SW-Motech quick release. I have bought a lot of stuff from them and never been disappointed. Gents the Givi PL528 side case racks are not for the 2014+1000. 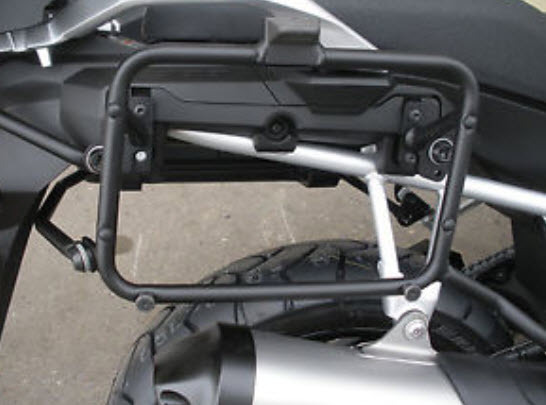 They are for the '02-'13 Suzuki V-Strom DL1000. Somebody is going to order the wrong part reading this Vee2 section. It was a hard decision with the GiVI racks 90 bucks cheaper but I bit the bullet and bought the SW Motech quick release racks. After studying the best photos I could find on both....my observation is that the SWM rack sits approx. 3" rearward than the GIVI rack. 3" is allot on a motorcycle when it comes to ergonomics of anything. While I'm not NBA material, I am 6'-0" and I figure that extra room to throw my leg over will come in handy. More to come. First pic GIVI. 2nd SWM.